Chariot Race was the card that proved the long-standing fan card guideline "don't do cantrip VP tokens" wrong. But is it any good? Chariot Race is bad as an opener. The best time to get it is usually around the third shuffle onwards. It behaves a lot like some other $3 cantrips (Harbinger, Scheme, Sage etc.) in that it hardly ever hurts to add it, so the main question becomes "could I do something better"? Chariot Race likes a high-value deck and thus encourages heavy trashing. You usually want maybe 3 of them, on boards where you want them. When buying them late-game, you should ask yourself whether you expect to activate them twice before the game ends. Chariot Race especially likes cards that give you control over your opponent's draw pile. In general, it is good to keep in mind that you get Chariot Races for the VP and not so much for economy. This section is devoted to just a bit of simple math that helps us understand Chariot Races a bit better. Let us for a moment assume a hypothetical situation in which your opponent and have decks consisting of 5 $3-costs and 5 $5-costs each. If you add a Chariot Race here, the chance that it fires is 25%: You need to flip a $5 and your opponent needs to flip a $3. So the expected output is 0.25 VP, 0.25$. Now let us say you add n Chariot Races. The chance of firing for each will be 5/(2*(9 + n)). But of course you have n of them, so the total output is 5n/(18 + 2n). As n tends to infinity, this expression approaches 2.5. That means that no matter how many Chariot Races you add, you will not make more than 2.5 VP per turn on average. What this shows is that the more Chariot Races you have, the less benefit you receive from each new one you add. This is bad. Generally speaking, if you build a deck you'd want the benefit-per-turn of each new card you add to be at least as high as the one of the cards you already bought. This is the reason why on most boards, you do not want to gain more than maybe 3 Chariot Races - at that point, there is usually something better you could do for your deck. The first thing to notice is that when the game starts, you have a lot of $0 cost cards in your deck. These will never provide any benefit to Chariot Race, so a key ingredient for a Chariot Race deck is trashing. With the same reasoning, Chariot Races of course want expensive cards in your deck, and cheap ones in your opponent's. Since you don't normally go for Chariot Race straight away, by the time you would get them you can usually tell which of you has the higher-value deck. If that is you, then grab the Chariot Races. If not, then you better have a plan to end the game quickly before your opponent grabs lots of VP tokens. The expected outcome however is that there is not much of a difference to speak of. In that case, Chariot Races are available as a gain when you have nothing better to do. A cute trick you can do to improve your Chariot Races is deck inspection and manipulation. If you know just which cards are on your - or your opponent's - deck, then you can choose the best moment to play the Chariot Race. It is good to keep some things in mind however. generally speaking, manipulating your opponent's deck is much better than manipulating your own, since your opponent's card stays on top for the rest of your turn while yours will be in your hand after you play one Chariot Race. you will still be forced to play your Chariot Races without prior inspection a good amount of the time, so don't overrate the effect that deck manipulation has. A final, if a bit niche, situation that benefits Chariot Races is discard + overdraw. With overdrawing, you can draw your deck while holding on to most of your Races. Then you can use a discarder to discard your expensive cards, and draw them back up with your Chariot Races. Generally speaking, when none of the options discussed above is applicable, then you should not go out of your way to get Chariot Races. But there are some noteworthy cases that can make it particularly bad. One such case are non-standard costs. A City Quarter on either of your decks will almost always mean that there will be no VP to be gotten. Potion-costs have the same issue. A game where either debt cards or Potion cards feature prominently will make Chariot Race next to useless. Some attacks - most notably Ghost Ship - can actively help your opponent block your Races. Finally, if you build a thin deck, then you need to ensure that your Races still have things left to draw by the time you play them. 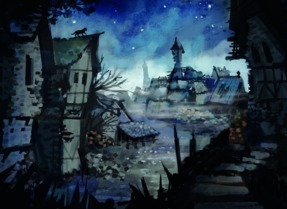 Cards like Scrying Pool can lead to problematic situations; in such cases you usually want to play your Races as early as possible. Finally, it should be pointed out that you can get more value from your Races if you track your deck. Also, once you have already played a Chariot Race, remember what card is on top of your opponent's deck. Sometimes you can guarantee that you flip a higher card if you know what's left in your draw pile. Or there may be an opportunity to let a well-timed Swindler remove that troublesome Province from the top of your opponent's deck. I think everything this article says is basically right but it sort of leads people down the wrong path? While it's absolutely true that more Chariot Races in a deck make each individual card less likely to score, the tone of that section seems to be leading the reader to the conclusion that they should only get a few or that they shouldn't try to win the split, which is absolutely wrong a lot of the time. There are tons and tons of boards where losing the split means you have to green and they don't, and those boards you might just end up losing. 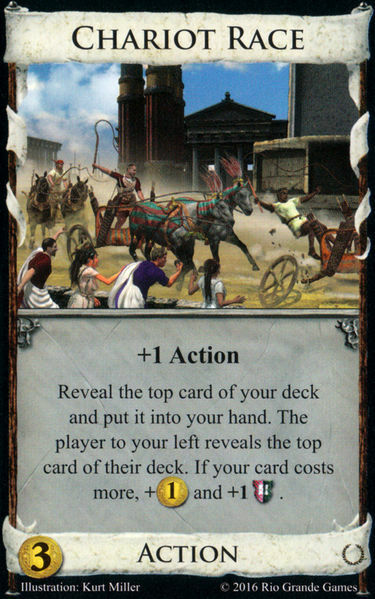 The major point I think any Chariot Race article should make is that the card is dramatically better the longer the game runs. I guess this is true of any victory card, but especially with Chariot Race since the VP output is spiky and less consistent than say Monument. Well I disagree, so perhaps it is not surprising that the tone of that section conveys that. Yeah I think this is not particular to Chariot Race, and it is also less of a big deal with Chariot Race because you won't be able to use Chariot Race as your sole source of VP anyway. Nice article! You do a good job explaining the basics of the card and what it does for you, while also addressing how best to use it. The Gist section especially is concise and says a lot of the most important things about Chariot Race in just a few words. I also like the Pitfalls section, reminding players of how non-standard card costs, certain attacks, and overdrawing can affect Chariot Race. A couple things I'd point out: though you imply this in the section on how to make Chariot Race better, just as trashing is critical for increasing your average deck value (also, you could probably emphasize this point even more throughout the article--Chariot Race is often pretty bad on boards with no trashing), so too junking can be very good for decreasing your opponent's average deck value. Also on specific card interactions, there are two especially important ones that are missing and/or criminally undersold. First, Sea Hag is one of the most effective cards for manipulating the top card of your opponent's deck, by making them topdeck a Curse before playing your line of Chariot Races. Secondly, putting Secret Passage in the same category as Mandarin and Count for controlling the top of your deck is crazy--Secret Passage is so, so much better than these (and the inspection cards as well) since it looks at more cards and is non-terminal, letting you topdeck the most expensive card in your hand, then play your Chariot Race for a very good chance of activation. I'd go so far as to say that Secret Passage is the number one Chariot Race enabler in Dominion because of how much control it gives you; with just a little bit of support, a deck that can play lots of pairs of Chariot Races and Secret Passages with a few expensive cards sprinkled in for topdecking can consistently generate points every turn while mitigating a lot of the randomness that usually plagues Chariot Race games. Chariot Race is an extremely tricky card which I don't totally get and it is pretty board- and play-dependent (yes, you gotta adapt to what the opponents are doing more so than otherwise). This is why I don't think that a rule of thumb like "get 3", is helpful. ...I'm not sure you've ever played a good Chariot Race board, then. Maybe Provinces get bought to end the game at some point, but it's more than possible to win with Chariot Race being most or all of your VP; this happens all the time. I don't think an article without a rule of thumb is helpful. I think the misleading bit about the diminishing returns and rule-of-3 bit is that what actually matters is the share of Chariot Races in your deck ( as long as you draw the same share of your deck per turn). If your conclusion was that it should be 3 CR in a deck of 10, it should be 6 CR in a deck of 20. Each expensive card that you add to your deck makes your existing and future CR more valuable. It's true I suppose. But if there is junking then both people junk; sure the Chariot Race player wants to junk their opponent more than they are junked themselves, but the same is true without Chariot Race, so I didn't think it particularly worth mentioning. Also on specific card interactions, there are two especially important ones that are missing and/or criminally undersold. First, Sea Hag is one of the most effective cards for manipulating the top card of your opponent's deck, by making them topdeck a Curse before playing your line of Chariot Races. Sea Hag runs into two problems. A) It is terminal. B) By the time you have set up a consistent Chariot Race deck, the Curses are gone. It may be that there is a board where you wouldn't usually get Sea Hag that you might get it mid-game for this effect, so that might be worth mentioning, but as a general rule I don't like to point at specific 2-card combos in articles, and I don't think this is powerful enough to break with that rule. Well, the categories weren't based on how good the cards are, but on their mechanics. Sure you can use Secret Passage for consistent points, but then you've spent $7 and two buys for what is essentially a Peddler with +1VP, which is not that impressive, and it still won't work if your opponent has a Province on top. Of course that is still way better than using Mandarin, and it also does its thing more consistently than deck inspection, but the problem is it doesn't do anything else, and those deck inspecting cards would also provide you with some other benefit while not being much worse at setting up Chariot Race. Maybe that section could use clarification if that point doesn't come across. It is not like, I don't know, talking about a sifter like Dungeon and saying something that you want 1-2 with trashers and 2-3 without trashers or whatever, i.e. a card where a rule of thumb is useful because you actually follow it during play. As Chris is me has said, Chariot Race is a card of which you sometimes want as many copies as possible and on some boards you want none. Since I was just looking at markus' statistics, I went ahead and checked out Chariot Race. Among highly ranked players, if they gain at least one Chariot Race, the average number gained is 4. So if you need a rule of thumb, I would place it higher than 3. When Empires came out, we thought that Chariot Race was one of the weakest cards in the set. But when we learned how to play it better, it became fairly powerful. It's more important to trash your starting deck than it is to add more expensive cards, or to find cute combos. And even if you don't get Chariot Races yourself, you still need to think about defending from your opponent's chariot races. Well if you look at those statistics they also state that Chariot Race has one of the lowest skill factors in the game, which I think indicates that optimal play is not that well understood yet. I would blame it's low skill factor on the luck that is involved with playing it. Because the winner gains 3.7 CR and the loser 3.2 CR on average. If 3 was the correct number to aim at, you'd rather expect the 3.2 CR player to win more. It's actually 50% of the games when the better player gains up to 3 CR and 50% where they gain at least 4. Maybe we are gaining too many, but then I'd rather have some example with a more realistic deck. The example was not supposed to be related with the number 3 in any meaningful way, it's just a "not too many" caveat. I may do a more realistic example, but more realistic also means more complicated and harder to follow. It's always a trade-off. Also, if the current meta is that you need to win the split, then of course the player with the better deck will win then split and the fact that they have more Chariot Races may be a result of them winning rather than the cause. As always, there are multiple ways to interpret the given data. Surely randomness also accounts for the low skill factor, but that alone isn't it I think. Magic Lamp is also very luck-dependent and still Secret Cave has one of the highest skill factors in the game. It behaves a lot like some other $3 cantrips (Harbinger, Scheme, Sage etc.) in that it hardly ever hurts to add it, so the main question becomes "could I do something better"? You usually want maybe 3 of them, on boards where you want them. When buying them late-game, you should ask yourself whether you expect to activate them twice before the game ends. When it comes to most sub-$5 cantrips, how many you ought to get comes down to the opportunity cost. In some kingdoms, you only have 1-2 opportunities past the opening to gain Chariot Race without passing up a $5+ card. In other kingdoms, you have more sub-$5 gains than you can use productively and Chariot Race is the only/best cantrip at that price point. So the relevant question is how far should you go out of your way to get Chariot Races? How often is Chariot Race better than a weak $5 cantrip (say, Treasury)? Is it often correct to invest in early +buy to try to get double Chariot Race on $6? When (and how much) does winning the split matter? I don't know how to answer these questions in general, unfortunately. Chariot Race seems to be one of the most contextual cards. I like the Diminishing Returns section, and it makes me suspect that winning the Chariot Race split rarely matters. It seems like in most circumstances, 3-4 can do almost as much good as 6-7. One exception is games where you can manipulate the opponent's top card. Another exception is games where you cannot completely rid yourself on sub-$3 cards; if you ever reveal such a card, you can activate nearly every Chariot Race you play that turn. I don't know if it's worth mentioning, but games where you can mill Provinces (e.g. Butcher, Salt the Earth) are especially bad for Chariot Race. A deck that greens early with Golds and Provinces isn't going to lose many Chariot Races, so if there's a way for that player to end the game quickly and reliably, Chariot Races are a pretty bad investment. I did this in a quick and dirty way by searching for "x gets 1 VP." 4-6 log lines after "x plays a Chariot Race. ", so there could be some edge cases that get counted wrongly, but that shouldn't affect the numbers much. With around 40% success rate it shows that good players seem to know when Chariot Race is good. For comparison blog article I sort of wrote earlier this year: https://dominionstrategy.com/2018/04/27/chariot-race/. I think one thing that isn't mentioned specifically in either article that is worth noting is just how much Chariot Race allows you to take advantage of having a better deck than your opponent - you shouldn't go gaining only 3 if your opponent is carrying 5+ cards in the $0-2 range around. Anecdotally, I seem to get crushed every time I don't get at least as many Chariot Races as my opponent, unless the game can be ended very quickly. Chariot Race is bad as an opener. I see why you say this but sometimes a cantrip opener is just fine when, say, you want to cycle your other power card (Remake, Ambassador, etc.) through without an extra stop card (e.g. Silver). What this shows is that the more Chariot Races you have, the less benefit you receive from each new one you add. Let us for a moment assume a hypothetical situation in which your opponent and have decks consisting of 5 $3-costs and 5 $5-costs each. In the scenario your opponent does not get any Chariot Races and has even 1 <$3, not only can you get all the CRs but you can hang on to your nice cheap cards (Wil-o-Wisp, Pixie, etc.). Band of Misfits and Overlord have a neat synergy w/ Chariot Race -- play 1 Chariot Race then if you can get the bonus again, play your BoM as CR, else play your BoM as something more useful. Plus BoM is more expensive than CR. Of course Overlord as a debt cost has a funny interaction when a Chariot Race finds it. Chariot Race likes a high-value deck and thus encourages heavy trashing. I think heavy trashing within a kingdom can be a problem for chariot race. A great way to defend against chariot races is to have a high value deck with heavy trashing and that innate defense is hard to overcome by having more chariot races. Moreover, the construction method for a chariot race deck can lead to lower coin incomes and lower cost cards in the deck, typically through an aversion to gold and provinces. This is pretty much covered/assumed by the article but not always directly mentioned. So the relevant question is how far should you go out of your way to get Chariot Races? How often is Chariot Race better than a weak $5 cantrip (say, Treasury)? Is it often correct to invest in early +buy to try to get double Chariot Race on $6? When (and how much) does winning the split matter? I don't know how to answer these questions in general, unfortunately. I don't really know the answer either but I'm guessing it's based on the innate defense of the opponent's deck. However, having muttered darkly about this mere days ago, I feel there deserves to be at least some mention of how matters become more complicated if Chariot Race features in a game with more than two players. This is a good article and I'm glad it exists. It's true that the marginal benefit of Chariot Race #4 is less than the benefit of Chariot Race #3, but what matters is the marginal benefit compared to other cards you could be buying, not the cards you've already bought. The 5th Village has smaller marginal benefit than the 4th, that doesn't mean you never buy 5 Villages. As mentioned by other people, junking is a good way to punish people who don't trash. This is missing discussion of the variance of Chariot Race. I think this is important. If you have 3 Chariot Races and your opponent has 7, then their average VP per turn may not be much larger, but it comes in big bursts that can quickly change who has the VP lead in the endgame. This makes Chariot Race a better pickup when you're behind. It also means you need to be more careful about VP leads than you normally would be. In late game I think it's enough if Chariot Race activates once before the game end. You aren't comparing to Tunnel, you're comparing to Estate. I think this is a crucial aspect of the card (and incidentally, probably why some people dislike it). Royal Carriage is also a great enabler. You react only when the revealed opponent card is cheap, increasing your expected VP output. I guess the reason I think the "don't buy a lot of Chariot races" advice is very, very bad as a blanket statement is in that kind of swinginess. If there's a copper on a deck, you're getting one point per CR that turn. If there's a Province, you're getting zero no matter how many you have. Sure ifyour deck is *mostly* CR's and their deck is *mostly* 5's your returns diminish, but I mean it's a $3 cost card; as long as you aren't skipping a more vital engine piece for it the potential gains on a high swing turn make it more dangerous / worth it. I dunno, I just feel like if your strategy is "generally just get 2 or 3" you haven't watched many of the really explosive Chariot Race games out there. I'm sure there's some online.